The Pleiades is an asterism in the constellation Taurus. It’s an open cluster of bright stars, which makes it very easy to find in the night sky. So easy that it’s often confused with the big dipper. It also happens to be about 380 light years away. Or 450 light years, depending on which measurement you trust. The distance to star clusters can be difficult to pin down. With a single star (so long as it isn’t too far away) you can use a method known as parallax. You can see the effect of parallax with a simple experiment. Hold up your thumb at arm’s length, and look at it with only one eye. Without moving your thumb, switch eyes, and you will see that your thumb appears to move relative to more distant objects. This shift is known as a parallax shift. If you bring your thumb closer and do the experiment again, you’ll see that the parallax shift is larger. If it is farther away, the parallax shift is smaller. In astronomy we can use the changing position of Earth in its orbit as the shift in perspective, and distant background stars as a reference for the parallax. But in star clusters that becomes a challenge. It is difficult to distinguish distant background stars with stars in the cluster, so it is hard to find a reference for the parallax. With the Pleiades this has led to some debate as to its distance. The VLBI result compared with Hipparcos and others. Credit: Carl Melis, et al. The Hubble space telescope has made parallax observations of three stars in the cluster, and found a distance of 440 light years, and ground based parallax observations also give a similar distance. But the results of a space telescope known as Hipparcos gave a parallax measurement of about 385 light years. You might argue that if you have several distance measurements, and one of these is not like the others, the outlier is probably wrong. But in this case Hipparcos, also known as the High Precision Parallax Collecting Satellite, was specifically designed to measure stellar distances, so one would think it should be correct. This became known as the Hipparcos anomaly. This week in Science a new measurement of the distance to the Pleiades has been presented, and it clearly shows that Hipparcos is wrong. The authors used observations from the Very Long Baseline radio Interferometry (VLBI) radio telescope array, from which they made a precise parallax measure of several stars in the cluster. What they found is that the cluster is 440.0 light years away, confirming earlier observations, and invalidating the Hipparcos result. This result is important for two reasons. First, it confirms that our understanding of young bright stars is correct. If the Hipparcos results were right, then stars in the Pleiades would be dimmer than stellar models predict. We now know that these stars are as bright as models had predicted. Second, it raises questions about other stellar distance measurements made by Hipparcos. 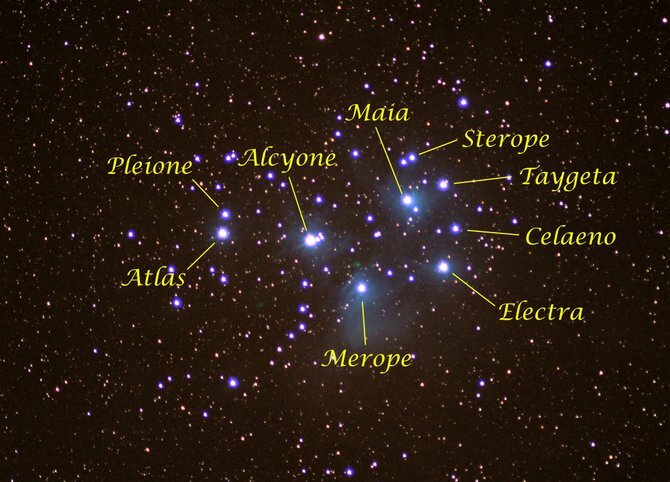 The satellite was specifically designed to measure stellar distances, and if it is 10% off for the Pleiades, it could be equally wrong about other star clusters. This latter issue could be resolved with new satellite known as Gaia, which will also look at the parallax of various stars. It is still in the process of coming online, but when it does astronomers are going to look very closely at its measurements to ensure it doesn’t have a similar systematic bias.